Things to consider before making extra payments. Get Your Share of the Bailout Money! If you've been making regular scheduled payments, choose Original. Otherwise, if you've already been making extra or unscheduled payments, choose Current. The first four rows will change when you switch between Original and Current terms. Enter the dollar amount of the original home loan (principal borrowed) without the dollar sign. Enter the annual percentage rate (APR) of the house loan without the percent sign (for 6.5%, enter 6.5). Enter the original repayment term of the house loan in number of years (whole years only, i.e., no decimal point). Select the month and year of your first mortgage payment. If this is an existing mortgage the extra payment mortgage calculator will assume that a payment has not been made for the current month, so the current month will be used as the start of the amortization schedule. Enter the principal balance owed on the mortgage (current payoff) without the dollar sign. Enter the current annual percentage rate (APR) of the house loan without the percent sign (for 6.5%, enter 6.5). Enter the current monthly principal and interest payment amount without the dollar sign. Be sure not to include the portion of the payment that may be designated for property taxes and insurance. Select the month and year of your next mortgage payment. If you would like to add an extra payment on a reoccurring weekly basis, enter the monthly amount on this line without the dollar sign. If no monthly extra payments are desired, leave blank or enter a zero. Note that weekly extra payments are applied in a lump sum each month based on how many weeks are in the month (e.g., 31 days in January = 31 ÷ 7 = 4.429 weeks x weekly extra payment). If you would like to add an extra payment on a reoccurring monthly basis, enter the monthly amount on this line without the dollar sign. If no monthly extra payments are desired, leave blank or enter a zero. If you would like to add an extra payment on a reoccurring quarterly basis, enter the quarterly amount on this line without the dollar sign. Note that quarterly payments will be allocated in the months of March, June, September, and December. If no quarterly extra payments are desired, leave blank or enter a zero. If no monthly extra payments are desired, leave blank or enter a zero. If you would like to add an extra payment on a reoccurring annual basis, select the month of the year you plan to make the extra payment and then enter the annual amount on this line. If no annual extra payments are desired, leave blank or enter a zero. If you would like to add an extra payment on a one-time, non-reoccurring basis, select the month and year of the one-time extra payment and then enter the amount on this line. If no one-time extra payment is desired, leave blank or enter a zero. Note that you can add up to 5 one-time payments. Simply select the number of one-time payments you would like to make, and the calculator will display that number of one-time payment rows. If you would like the results to include an amortization schedule, move the switch to the "Yes" position. Otherwise move the switch to the "No" position. Based on your entries, this is the amount of your current monthly principal and interest (PI) mortgage payment. This does not include property tax or insurance payments. Based on your entries, this is how many payments you have made from your first payment through last month. If the current month is the same as the first payment date you selected, the number of payments made should be zero. Based on your entries, this is how much you still owe (principal balance) on your home loan after deducting all of the principal payments you have already made. If the current month is the same as the first payment date you selected, the number of payments made should be zero. After tapping the "Calculate Savings" button, the chart below will show the months remaining and the interest cost without making extra payments, with making the entered extra payments, and the difference between the two (savings). This free online calculator will calculate the time and interest you will save if you make one-time, weekly, quarterly, monthly, and/or annual extra payments on your house loan. If you would rather calculate the size of the monthly prepayment needed to pay off your mortgage within specified time frame, please visit the Early Mortgage Payoff Calculator. 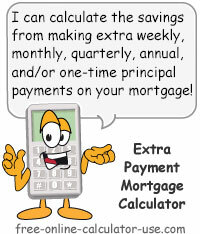 Or, if you are only interested in making monthly prepayments, please visit the Prepay Mortgage Calculator. Finally, if you would like to change the extra payment amount after so many payments, please try using the Loan Affordability Calculator, which allows up to 8 different extra-payment modifications. Check either the "Original" (original mortgage terms) or the "Current" (current payoff amount) radio button. Original: Enter the original mortgage principal amount. Current: Enter the current payoff amount. Original or Current: Enter the mortgage's annual interest rate. Original: Enter the original loan term in number of years (whole years only). Current: Enter the current monthly payment amount (principal and interest portion only). Original: Select the month and year of the first payment. Current: Select the month and year of the next payment. Enter one or more extra amounts and select their associated dates. Indicate whether or not you would like an amortization schedule included in the results (Yes or No). Tap the "Calculate [Mortgage Extra Payment] Savings" button. If you would like to print a copy of the calculated results, tap the "Printer Friendly Report" button. This will open the report in a new window for printing. Things to consider before making extra payments on your mortgage. If you have other credit balances that have a higher rate of interest than your house loan, you will save more time and money if you pay off the higher-interest credit balances first, and then redirect those higher-interest debt payments to paying off your mortgage. If your employer matches all or part of your 401K contributions, you might come out ahead by contributing the extra payments to your 401K instead. So be sure to run your plans past a qualified financial planner (one who will not be earning commissions from your investments, and who is not trying to sell you life insurance) before starting your extra payment mortgage plan. Will Extra Payments Be Applied or Escrowed? Be sure to check with your home lender to make sure you can make extra payments on your mortgage without penalty. Believe it or not there are lending institutions out there that will penalize you for attempting to reduce the massive bonuses they pay to the top executives -- despite the fact that they will still make a great deal of money on your house loan. Here's a pet peeve of mine. During the early 2000s, lending institutions borrowed too much money to people who had not proven themselves to be credit-worthy, all for the purpose of getting as rich as legally possible on the backs of hard working men and women. In a nutshell, this ultimately caused the financial dominoes to start falling that eventually led to the economic collapse of 2009 -- which put many of those hard working men and women out of work and out of their homes. And what happened to those that managed to keep their jobs and stay in their homes? They were saddled with having to foot the bill for bailing out the failing financial institutions that were responsible for the financial meltdown in the first place. And what did those financial institutions do with a large chunk of their bailout money? They used it to pay outrageous bonuses to the same top executives whose idiotic decisions put millions of Americans out of their jobs and homes. Does that make you mad? Mad enough to do something about it? If so, then here's idea on how to get back some of your tax dollars that ended up in the pockets of lending institution executives. Accelerate your debt payoff and stop borrowing (renting) money from them! Every dollar you add to paying off your debt early is like reaching into the pocket of one those overpaid executives and taking back a portion of the money you worked so hard to earn. Their pockets are teaming with money that was originally meant to support your family's future financial well-being -- but instead is being used to build lavish tennis courts and swimming pools in the backyards of their second and third mansions. The extra payment mortgage calculator will show you that even foregoing small, non-essential purchases for the purpose of making extra payments on your debts (preferably your higher-interest debt first, then on your house loan) can take thousands of dollars of your money back from the executives whose ruthless quest for wealth nearly bankrupted your country (let's hope "nearly" remains true). Consider this savings as your rightful share of the Bailout money that was misappropriated to executive bonus checks.